Batch tested by Informed-Sport, our Recovery Gel has been tested for naturally occurring banned substances by LGC's world-class sports lab in line with the World Anti-Doping Agency (WADA) guidelines, and is officially safe for professional athletes of all levels. 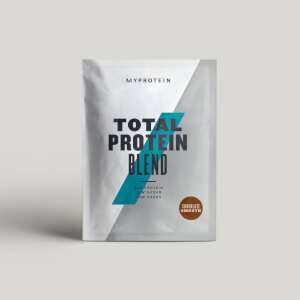 It contains 15g of protein to boost your daily intake, vital for growing and maintaining important muscle,1 and a massive 20g of carbs, helping you to refuel2 even after the toughest of workouts. Then there’s the BCAAs — these naturally occur in protein and help to build and repair new muscle,1 before, during, and after workouts — so you’re always ready for the next session. And, we’ve included a blend of essential vitamins and minerals, including vitamins B6, B12, magnesium, and riboflavin — reducing your tiredness and fatigue3 after training hard. 4. Creatine is proven to improve physical performance in successive burst of short-term, high-intensity exercise. The beneficial effect is obtained with a daily intake of 3g creatine. When to take Recovery Gel? There’s no need for water, you can have these immediately after training. What does Recovery Gel work well with? Consume as part of a balanced and varied diet. Not suitable for vegetarians and vegans. Keep out of reach of children. Cherry: Greek Style Yogurt (Milk) (26%), Maltodextrin, Water, Hydrolysed Collagen, Cherry Juice Concentrate (4%), Acidity Regulator (Glucon delta-lactone), Stabiliser (Pectin), Fermented Branched Chain Amino Acid Blend (0.4%) (Leucine, Isoleucine, Valine, Emulsifier (Sunflower Lecithin)), Electrolyte Blend (0.3%) (Potassium Chloride, Calcium Lactate, Magnesium Carbonate), Glutamine, Natural Flavouring, Preservatives (Potassium Sorbate, Sodium Benzoate), B-vitamin Blend (0.01%) (Niacin, Riboflavin, Vitamin B6, Thiamin, Vitamin B12), Sweetener (Sucralose). Strawberry: Greek Style Yogurt (Milk) (26%), Maltodextrin, Water, Hydrolysed Collagen, Cherry Juice Concentrate (2%), Acidity Regulator (Glucon delta-lactone), Stabiliser (Pectin), Fermented Branched Chain Amino Acid Blend (0.4%) (Leucine, Isoleucine, Valine, Emulsifier (Sunflower Lecithin)), Electrolyte Blend (0.3%) (Potassium Chloride, Calcium Lactate, Magnesium Carbonate), Glutamine, Natural Flavouring, Preservatives (Potassium Sorbate, Sodium Benzoate), B-vitamin Blend (0.01%) (Niacin, Riboflavin, Vitamin B6, Thiamin, Vitamin B12), Sweetener (Sucralose). Fruit flavoured yogurt based protein sports gel drink with branched chain amino acids, electrolytes, B vitamins and sweetener. So much easier than having to faff around with protein shakes in the gym bag. Really easy to use and affective. The taste is a little synthetic but I don't mind as it packs so much of everything I need into a little pouch. I would definitely recommend to anyone who's bored of protein shakes. I only started using pre and post workout supplements recently and find that the Recovery Plus Elite adds a little pick me up energy after my workout as well as provide me with the essential nutrients to recover until brekky. The drawback is that I am on a weight loss journey so my PT says the carbohydrate content is too high. Great post workout gel for quick and easy nutrients! 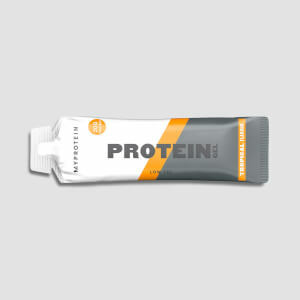 If you are bored of protein shakes then this product is a great alternative. 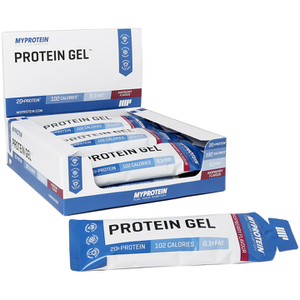 I use a variety of MyProtein gels purely because I am constantly on the move and find it difficult to mix shakes when i'm in a rush so this is great for people on the move. It's small and light so you can just throw it in your gym bag to take after workouts. No need to mix it with anything, just tear and consume. I also generally prefer the yoghurt/gel based texture over shakes. The texture is like yoghurt but a lot thicker than the Protein Gel, which makes sense as it will also have carbs in there for recovery. The taste is good, not excellent but good. I am a huge fan of the raspberry flavour protein gel so I order the strawberry flavour recovery plus elites as it's the closest I can get to raspberry. The flavour isn't bad but because of the thick texture, it definitely tastes and feels like you're having a protein/recovery/"unnatural" gel which is a bit of a turn off for me as I'd much rather have one that tastes and feels like normal yoghurt. But it's not that bad and I can understand that it needs to pack in a lot of nutrients into that gel. In terms of effectiveness, I think it's great. My workout during the week involves both cardio and weights so by the time I finish, I am absolutely starving. This product instantly provides me with good nutrients to aid in the recovery and I tend to have it immediately after working out or within 15 minutes or so. Overall, great product which I have at least once or twice a day post workout depending on how many I do. If MyProtein can make it taste and feel like the Protein Gel products then it would get a 5/5 for taste too. Otherwise, still a great product! The first time i tried them i did no really like the taste. But after a few times you learn it and they are actually really good. The best part is the convenience of always having it around ready to go when u need. Perfect. They taste similar to a Bakewell Tart, as one would expect from something with cherry in it! Though, as others have said, it's incredibly sweet and tastes very artificial. That said, it does the job really well and is so much easier than making a shake, can eat the whole thing in a about 5 seconds. I bought these in strawberry (being a strawberry freak) and as cherry as samples before going the whole hog. To my surprise, I actually favour the cherry ones! Both flavours are great tasting and are easy to stomach. The only other yogurt style recovery product I've tried which is from a cycling focused manufacturer was the consistency of thick paint i.e. so solid you almost had to chew it. This product on the other hand is more like Greek Yogurt in that you can almost pour it out of the tube. Definitely would recommend it and will definitely be buying more. High protein cereal or porridge? Absolutely love these in Cherry flavour, can't pick fault with them. I'm not a fan of shakes smoothies or powders so these are an ideal way for me to get those BCAAs in after a workout. The taste is a bit bitter but worth it. It really is a great alternative product for after your workout. I am so bored of protein shakes after 14 years. This makes a great difference. I highly recommend. Just about to order another two boxes. I absolutely love this product, slightly prefer the cherry flavour though. So convenient to take, a bit artificial tasting but it's only a minor point. Just wish they were in stock more often, as this was out for over six weeks. Much prefer to a shake.